Being an easily distracted person can get one in trouble and I remember being roundly scolded by my father when I was little, for forgetting that I was supposed to be fetching him a glass of water or something as I wandered off, his request quite easily forgotten. I guess the attention deficit must have been pretty bad if it warranted him putting a little clause in his daily prayer, exhorting the Almighty to intercede on my behalf. But I can’t help laughing a little at myself sometimes as I register my own distraction and continue to go about multi-tasking through my housewifely day. Today my body has not been very successful in fighting off the allergens (which I am beginning to suspect are due to mold spores rather than Fuzzy) and I awoke early, my bronchiolar passages blocked. I have been told of the beneficial uses of honey as an expectorant, and tried sipping a honeyed mug of hot water to see if it had any effect, but no go, the inhaler had to be used. So after a very lazy start to the day, during which I succumbed to the will of the internet gods, I was prodded into making breakfast by a hungry Huz. A packet of wheat thins with my mug of tea works just fine, but Huz being a manly man needs his protein fix. Anyways, it was 11 am already, and he was beginning to look a bit woebegone by now. I’m a bit dazed due to lack of oxygen in my brain, and the last thing I want to do is make breakfast. All I want to do is sit somewhere very quietly…..and breathe. Two days of hard labour though have not been very good for my right forearm muscles, and I contemplated this as I thought of the kind of eggs I would make for him. An omelette would require the chopping of onions and tomatoes into tiny pieces, not possible with an achy forearm…. But why (I wondered as my gaze wandered) was the assortment of empty jars and jam bottles lying there on the counter taking up unnecessary space since so many days? ‘Right, time to put those away in the cabinet’, I thought, as I climbed atop a footstool in order to reach the place where I store such things. That done, I glimpsed the bowl of the food processor sitting needlessly all by its lonesome, unused for days (taking up unnecessary space) so while I was up on that footstool, I thought I might as well put that away as well. The blender/food processor storage space is rather cramped, so things have to be manoeuvred rather carefully in there lest something fall to the ground and break. Which is why my lazy self had been postponing the putting away of the food processor bowl for so many days after making the damned pesto. I congratulated myself on a job well done, and remembered why I had come into the kitchen in the first place. Oh yes, breakfast for Huz. But wait, what are these wet towels doing on the floor, next to the washing machine? How very messy. We can’t have that. So I carried them over to the balcony and hung them all out to dry, and while doing that I noticed how very blue the sky looked today. The sun was shining promisingly and I didn’t think it would rain at all. A good time to put a batch of clothes in the wash! Gathering up a load of sorted clothes (a batch of mostly pink, red and orange) I put them in the washing machine, not a minute of sunshine to be wasted. Alright then, time to tackle those eggs. Four should be enough to tide us through to lunch, and it would be a late one considering how slow and lazy and wheezy I was…. A little red chilli powder and some salt was added to the eggs and whisked with a bit of milk, when I had the bright idea of putting some fresh chopped basil into the mix….. Since I was still in my nightgown, I had to fetch myself a shirt to wear on top of it before making my way down the stairs to the courtyard where I keep my pots of basil and cut a nice leafy stalk. Then back to the kitchen to rinse the leaves, chop them up, whisk them into the eggs and……oh wait…I forgot to warm up the saucepan…. Saucepan on the stove, a bit of cooking oil poured in, but before I pour in the eggs…….where’s the bread? It must be put in the toaster BEFORE scrambling the eggs or else the eggs will get cold while the bread is toasting. Can’t have that! Somehow or the other, everything always gets done, doesn’t it? I’m glad Zahooran was there yesterday though, to scrub the blackened bottom of the cooker after I burnt half the chickpeas that I had left on the stove while I wandered off to reorganize my wardrobe…. But I will have you know that I managed to make something very yummy out of the buttery soft chickpeas that were salvaged….and they didn’t taste burnt at all. But then I am bad that way!! I wish I had a load to do of pinks, oranges and reds. Yes, there are a half bazillion in Pakistan, including a college. Google homeopathic physicians Pakistan, Karachi, and get rid of those allergies! Okay, but remember that the medication, if chemical, will work to destroy your liver and kidneys, and WILL have interesting side-effects. Homeopathic medicine has only side-benefits. I am glad you feel better though! Aaaack!! You sure you aren’t a lawyer??! Your comment that all you wanted to do was sit and do, of all things, breathe, made me laugh out loud! Now that’s radical, if I’ve ever heard it! Bless your heart. Good to hear that Zahooran is back. Maybe that will help with the allergies. By the way, your basil looks lovely! I love pesto! This was a great post, Munira! The basil has grown A LOT since this picture was taken, and I’ve already harvested enough of it to make two batches of pesto! I’m glad you got a laugh out of this Kathy, really, I even made myself laugh, which is great when I’m feeling down! That basil does look amazing! Mine got bugs on it and now it is so sad. 😦 Sounds like a delicious breakfast, though! Uh oh, buggy basil is no good 😦 Did you try spraying it with something that would kill them organically? Like garlic/green chilli spray…I’ve heard it’s great as a pesticide. I think we ALL live in an age of distraction, don’t you think? You’re right, I get that way too, and IT IS scary! Distractions distractions. It’s called multi-tasking, huh? I sympathise with your allergen problem, Mun. My father suffered terribly with asthma when we were young as a result of working for years on a farm. Dust and pollen and such. But having said that, you do have a knack of even making scrambled eggs sound interesting. Well done. Wouldn’t happen with a homeopathic physician. Their motto is, or should be – get rid of the allergies, not the animal. Allergies to things in the world does mean there’s a disconnect somewhere in the immune system, it is in a state of hyper-response. Not a good way to live. And a chemical doctor can not cure, they can only palliate while adding side effects, nutrient depletions and more. Anyway – my $ .02! Thanks Patty! Maybe I’ll just go over and see my father’s favourite homeopathic doctor…..see what she says. No harm giving it a shot. I tend to be very impatient with my chores if I’m in the mood to write something, and the only time I really enjoy cooking is when I WANT to cook something exceptionally yummy. Because I’m a foody, I try to make even quick fixes be yummy, otherwise it makes me unhappy, haha, I’m babbling. I hope I make sense. But I can imagine how tough it must be for you (a writer) to put off your writing to get through something as mundane as laundry. Aargh! Oooh, I just came back to read some of your answers to comments and found that you changed your theme. I love it! And your new header is gorgeous! Another of your delightful photos? And I have YOU to thank for being inspired to change my look! So I’m thrilled you approve! And yes, that’s the champa from my courtyard……! It’s so good to be back reading your post! 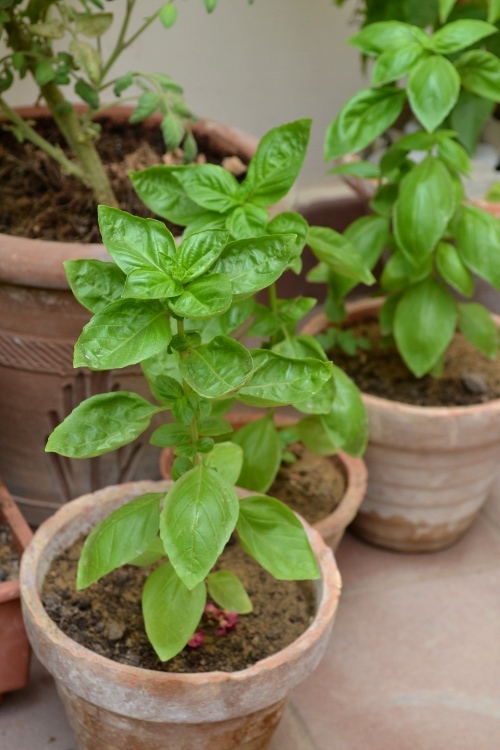 And it’s a pleasure to see basil growing like yours and to see how it’s put to good use by you. You wrote such an interesting blog despite not feeling very well. I really admire how you cope on such a day when you feel like you just want ro rest. I burnt some carrot pieces the other day because I had put only a little bit of water in the bottom of the pot to more or less steam them. And then I got distracted cutting onions for my goulash when that terrible burnt smell alerted me to what was going on. I had to throw all the carrots out because they were totally burnt. But it was only a small amount really. Then I turned to soaking the pot in Bi-Carb. With a lot of scrubbing I eventually got the pot clean again. I did not want my ‘huz’ to see what had happend to one of our best pots. Dinner had to be ready on time for when huz would come home. But first I had to open all the windows in the whole house to get rid of that awful smell! So good to see you again Aunty Uta 🙂 And you know what they say….no rest for the wicked! Hahah! Now THAT’s hilarious! i’m usually frantic when it comes to doing vaghaar on stuff! No way I could be distracted when mustard seeds are crackling and the curry patta has to be thrown in and all of it poured into whatever that needs to be ‘vaghaarofied’ before the mustard seeds start popping right out of the fry pan in their agitation! Love the title!! I’m very bad at sticking to a single train of thought and/or action myself…but you probably know me enough to know that about me 😉 Do you think it’s a Saggitarian thing??!! And I do agree with you M…everything does get sorted somehow…little and/or big…my Life is definite testament to that fact!! So many changes in the offing…it exhausts me just thinking about it, but somewhere within I know instinctively “it’s going to be Ok.’ Not easy, but Ok! How I wish it could be both…sigh. Thanks H! I thought it rolls very well off the tongue meself! Don’t know if it’s a Sagit thing, though it very well could be….hmm, must research this one of these days. And I’m glad we’re agreed on everything muddling its way to completion somehow. I think life gets easier once you give up on perfection, what say you? If it’s good, it’s good, and if it isn’t, that’s okay, we’ll live!